NOW WITH REAL TIME MULTIPLAYER PLAY AND CHAT. 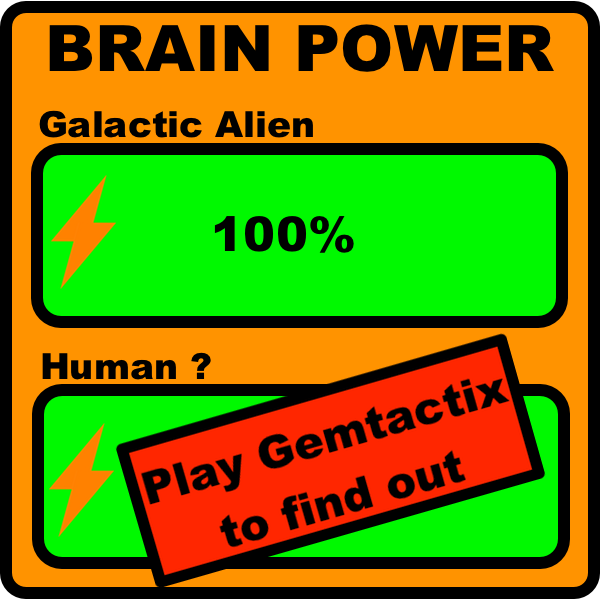 GEMTACTIX, THE BRAIN POWER GYM. Win the game by moving your craft around to capture enough of the opponents golden gems to stop them capturing your gems. The game ends when a player cannot capture anymore gems : The winner will be the one with the most gems. Unlock gemstone treasures as you win your games. There are 24 gemstone treasures to unlock plus one infinity move gem treasure that only a few will unlock. L1 - Trainee Level: You Versus Galactic Control Trainer. L2 - Expert Level: You Versus Galactic Control Expert. L3 - Master Level: You Versus Galactic Control Master. Multiplayer - You Vs World or Vs Facebook Friends - internet connection required (wifi or 3g +). Multiplayer - You Versus Your Mates in the pub, bar, cafe, restaurant, plane, beach ... use your phone or tablet device just like the traditional board game (no internet connection needed). 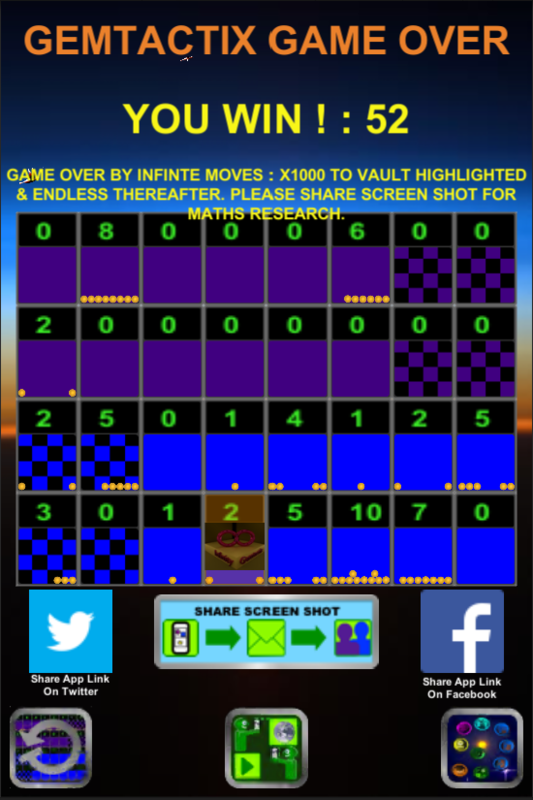 Scores are based on the golden gems captured, the time taken and the difficulty level. Please see the 1 minute 20 seconds tutorial on you tube below. 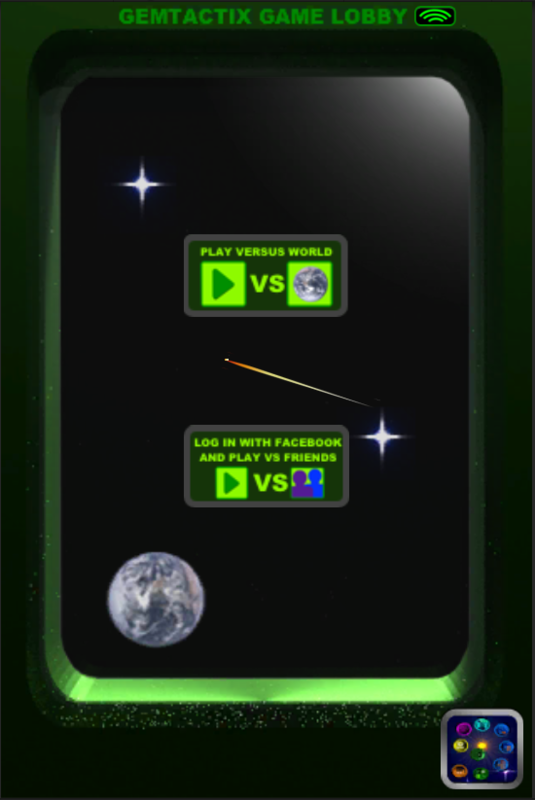 1 - Press to "Play Versus World" and select a match to join or Start a new game match and wait for an opponent. 2 - Press "Log In With Facebook and Play Vs Friends" to send a game request to one of your friends who have downloaded the game. If none of your Facebook friends have downloaded and connected to the game, show and invite them to download and connect to the game next time you meet them. A rare Infinity Move position is shown below. If you attain one of these, please share the screen shot on public social media with hastags #Gemtactix#Infinity or email a copy the screen shot to support@gemtactix.com as they are of mathematical interest. Capture as many gems as possible as this gives you more options to win the game. When capturing think if the capture leads to a quick end of turn or if capturing from the next vault leads to more captures. Also think if the move makes your defense stronger or weaker. Movement and captures that give you a full loop on your side of the board give more chances for future capture but also leave your gems exposed to capture by the opponent. Analyze the strengths, weaknesses of your position and those of the opponent and see what opportunities or threats exist in the positions. Remember the reverse capture for your self and that the opponent can use this as well. When short of Gems use defensive tactics to minimize losses and use the opponents weaknesses to plan for a recovery capture. When playing higher levels or experienced players, proper defense of your starting positions can make the difference between winning or losing. Forcing the opponent to make errors can be a useful opening tactic. 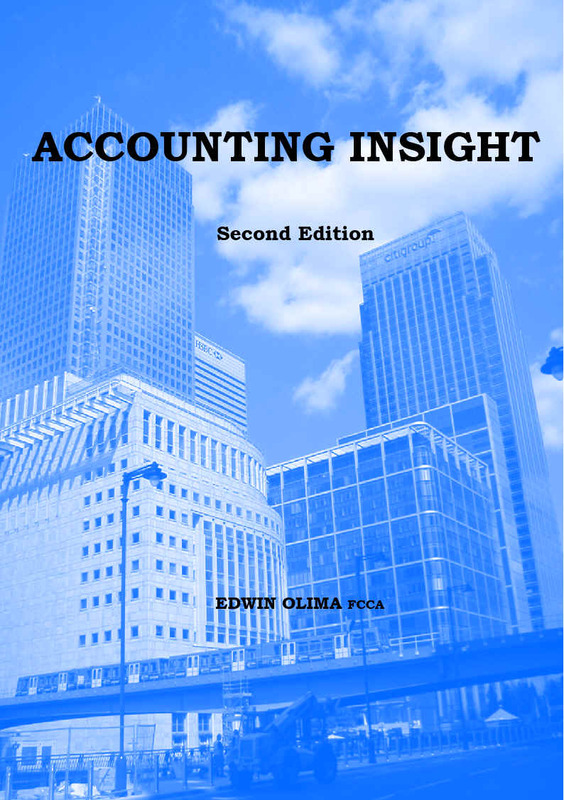 Make sure your sums and movement plans add up correctly as errors can cost you the game. The Gemtactix game is derived from mancala games played across Africa and the Middle East, in particular the variant mancala games played in Eastern and Central Africa. The origin of the games are a mystery: however what is known is that they have been played for many centuries as a social pastime for communities on Earth. These mancala games have similarities to Chess and Draughts board games as explained in the comparison page link below. The Isphere by Beat It. Sci-Fi Warm Background loop by Sound Tricks. Sci-Fi Strange (background theme) by mackaymusic. Sound Effects: Sound Pack 114 by UnlimMedia. Gem Drop Sound Effect: by Time Tracer Limited. Please email: support@gemtactix.com with your comments, queries and issues, thanks.